Let’s face it, the smart, Flatscreen, widescreen TVs of today are the stars of every lounge or bedroom. They’re the bits of kit we arrange our furniture around so we can get a good view. And a good way to ensure everyone gets exactly that is to wall mount your set. It’s a job that calls for the kind of expert skills our team here at Harrow Aerials possesses. They’re experienced at installing all makes, models and sizes of TVs in lounges, kitchens, bedrooms, man caves, bars, clubs and restaurants across north London and Middlesex. So why get stressed out trying to wall mount your TV yourself when you can sit back and relax and get us to do it for you? Call our team and we’ll make sure it’s up on your wall fast and straight, on the bracket you want and with not a wire in sight. Call us, and we’ll book you an appointment fast, and get the job done on the same day (95% of the time). We’re ready to help local residents who might just need one TV wall mounting, and local businesses who may need several sets up on their walls. We always try to get to you faster than any other company in the north London / Middlesex area. And sometimes that means we’ll be there with you to hang your TV on the same day you call us. 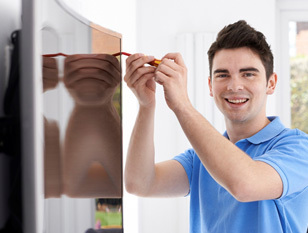 We’ve got the skills – when it comes to wall mounting TVs, experience matters. And our Technicians have plenty. 12 month guarantee –that should give you the reassurance you need that the people we’ll get to do the job know what they’re doing. Which bracket? We’ll help you choose. You might not know that there are options when it comes to wall mounting brackets. You can choose from flush, tilt & swing, or remote control. Pick the one you want or ask us for a recommendation. Yes, while our team are at your place hanging your TV, they’ll make sure everything’s working by setting up your broadband and updating or upgrading any of the systems you use. And instead of wading through your TV’s user manual, why not get one of our Engineers to show you what’s what? Pretty much every pub, club or bar has a TV or two, and they’re usually up on the wall to free-up more floorspace for people to socialise. If you live in Middlesex/North London, chances are one of the Harrow Aerials team has helped get that TV on the wall. So when you need a similar service, or if you’re starting a new commercial venture or shifting things around in your establishment, call us. As well as the guarantees we offer, we can give you added reassurance by telling you that all the TV wall mounting we do carries full public liability insurance. To book a TV wall mount appointment in the Middlesex/North London area, call Harrow Aerials on 020 8419 8950.